A long while ago I saw a post on the Baren Forum blog about a moku hanga workshop that Mike Lyon had taught in Connecticut. In an accompanying photograph, I saw that Mike had his students paste their scanned and inverted sketches face up on the block and simply cut through the paper. This is in contrast to the rather tedious method I was taught, where the sketch is pasted face down and then the back of the paper is carefully rubbed off until the remaining paper is nearly transparent. I've actually gotten blisters on my fingers from rubbing away the paper on many blocks in one sitting! Anyway, I always meant to try Mike's method and today I finally did. These three blocks are tracings from three different satellite views of a glacier in Greenland that's breaking up. I traced them, scanned my tracings, blew them up to size and flopped them for output. Then I pasted the computer printouts onto the blocks face up. Ready to cut! Although I have the blocks carved for a print about transgender that I was working on before I moved, I can't quite get the energy to keep going with it right now. I'm anxious to try out my new studio, but I want to do a print that isn't very fussy while I get the feel of the new space. An article in this morning's paper caught my eye. It was about new predictions by scientists at the University of Arizona that in the next century sea levels will rise by one meter (39 inches) no matter what actions we take to try to halt it. Some scientists say it will happen as soon as 50 years from now. 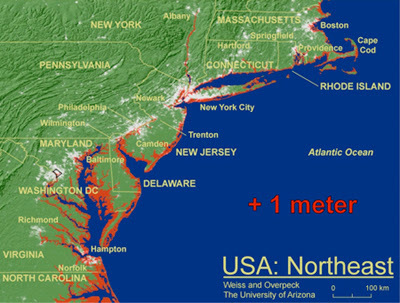 This particular study showed maps of United States coastal areas and how they would be affected by a 1-meter rise in sea level. It looks truly catastropic. I was never happy with the print I did about global warming, so today I started a new one. As usual, I'll take you through the steps. Tonight I planned the design and tomorrow I'll transfer the drawing to the blocks and hopefully start carving. Yesterday I spent all day, and I really mean ALL day, putting together this mission-style office furniture from Staples. This is my computer/illustration workspace, a smallish room (130 square feet) with a sloping ceiling and a little porch where the employees can go out to refresh themselves (see employee below). Below is the setup in my second studio, the moku hanga room. This is just one wall in a large room (200 square feet) that has two windows, a large storage closet, and plenty of space to put up more tables when I want to work large. Even with the two windows, the room is a bit dark because of the large trees outside, so I'm experimenting with lighting options. These lamps appeal to me because the shades diffuse the light, making it very even. Right now the bulbs are incandescent, but I'm going to try some compact fluorescent bulbs to see if I can get a less yellow light. Does anyone have lighting tips to share? For those in the Pittsburgh PA area, the Mary Hulton Phillips Gallery at Butler County Community College is hosting a Japanese woodblock prints exhibit today through Sept. 28 in the Science and Technology Building. Purchased in Japan at the end of WWII, this is the first time the prints have been displayed together. Call 724-284-8505 for gallery hours or visit the web site. Also in the Pittsburgh area, be galleries is showing images from Japanese woodblock artist Ohno Bakufu's series of underwater fish prints called The Great Japanese Fish Picture Collection. 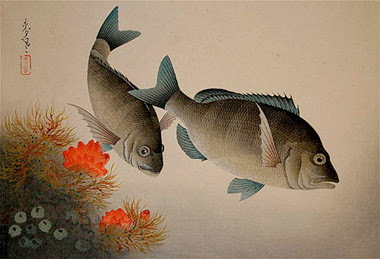 These natural history prints, which appear in many reference works, are well known to both print collectors and fish scientists. Be galleries is located at 3583 Butler Street in Lawrenceville and the show runs through September 29. An in-depth article in the Pittsburgh Post-Gazette describes Ohno's work. Wish I lived closer to Pittsburgh! Last night I finally got out my carving tools again. When I was carving at my last house-sitting gig I didn't have a sturdy table or a bench hook. I wasn't able to cut very deeply under those conditions, so all the blocks I did then still need lots of clearing. It felt so good to spend a couple of hours with the chisels. And then we put together the kitchen island below. It was shipped to us in pieces in a huge 125-pound box. Living on the third floor has some drawbacks.